We had a wonderful time at Brick fest live at the Pasadena convention center ! They had lego tables everywhere ! 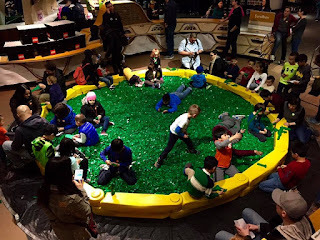 Kids could choose from building Lego's , seeing pictures of famous people ,playing Lego video games ,a huge picture of a Lego batman , lego towns like an Indian village or carnival . And you could even buy lego figures or Lego sets .I think one of my favorite things was a picture of Starry night by Vincent van Gogh. They even had a special play area with huge bricks for very young children.